@MrsWindu The idea that Kylo have seen a different timeline is such a cool idea. @rey09 A lot of people in ST production worked with heavy time travel plotlines. Additional SW content just recently included time travel storyline. The same thing was with the Force bond: they included a Force connection between Ezra and Maul before TLJ. @ZioRen wrote: Lots of folks on Reddit are also speculating time travel or Reylo baby. I've figured it out; the option that would be mega controversial and maybe delightful to some. I'm a bit meh about MSW.. Anyway, I haven't read it fully yet but I went straight to the references to the Knights of Ren.. There are two: page 70 and page 118. Page 70 - says Rey saw 'the menacing Knights of Ren' in her vision (at Maz's castle in TFA). that's not new.. Page 118 - this is new to me! This is the first time I've seen a confirmation that the Knights of Ren are force users!!!!!!!! A group of dark side users!!! whoooo!!! To me this makes it more likely we'll be seeing them in IX! 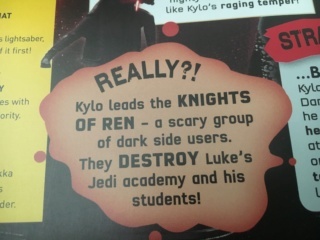 edited to add: lol - I forgot to mention - saying Kylo and the KOR destroyed Luke's Jedi Academy and his students is new toooo!!!! This does increase the chances that the current memberss of the KOR were fellow students at the academy no? Seems to me the KOR are not a mixture.. thoughts anyone? @special_cases wrote: @MrsWindu The idea that Kylo have seen a different timeline is such a cool idea. oo do you have a link? Random thing I just remembered, weren't they supposed to film in Scotland? Did that ever happen? It's like they started in London, went to Jordan, and came back and never left. If they are able to come up with a good story, the idea of a another timeline could work. It could add an interesting twist to what Kylo saw and his dynamic with Rey in IX. As for the possibility of Kylo’s mask returning, I have somewhat mixed feelings, as I like masked Kylo, but like unmasked Kylo even more. However, I love the intimacy of him only removing his mask for Rey, like he did in TFA. It makes the fact she “marked” his face more poignant. In fact, I think I might prefer it if only Rey and Leia see his true face in IX, as it adds to the possibility of redemption because it hides his true identity. i think their relationship is the core of this trilogy, it's created step by step , adding one piece at a time. it's such pure and mysterios , that everyone should ask , what are they ? ,, it's so good, it's beyond words. one thing I'd like to see is a fight like Han and Leia that ends with a nice kiss. I’m dubious about using time travel in a Star Wars movie but I’m willing to keep an open mind. I did like how Rebels handled A World Between Worlds. It is interesting that Jack Thorne was rumoured to be involved with the Trevorrow script rewrites. Jack Thorne having co-wrote the script and story for Harry Potter and the Cursed Child, the plot of which deals heavily with time travel and attempting to prevent the death of a certain character which leads to all kinds of unforeseen circumstances. If there was a time travel element to Trevorrow’s script, maybe that aspect survived through to JJ and Chris Terrio’s version of IX. JJ has had experience of writing alternate timelines before in various projects. Chris Terrio co-wrote Batman V Superman which included Bruce Wayne having a prophetic dream which was interrupted by someone appearing through a portal to warn him about Lois Lane’s importance in future events and telling him to gather together what essentially ends up becoming the Justice League. @YeeRees wrote: I’m dubious about using time travel in a Star Wars movie but I’m willing to keep an open mind. I did like how Rebels handled A World Between Worlds. Lol it will be like in Charmed. If it's true... I can't wait! Imagine how the fandom will react. Suddenly just Reylo plotline will become something safe and normal haha They will be like "Okay I understand and accept love between Rey and Kylo but Matt Smith as REYLO kid? JJ raped my childhood, my adulthood, Rian Johnson at least was respectful to SW rules, Rian Johnson was respectful to our female protagonist Rey, she just touched Kylo's HAND and nothing more!1! !1"
omg Matt Smith actually has big cute ears! In relation to TFA and assuming that the trilogy has been planned out from the beginning, a reylo baby would kind make sense. Wasn't it in TFA novelization that Rey saw a boy in her vision at Maz's? What if it wasn't Ben? Since in that same vision she saw Kylo with the KoR (something that hasn't happened yet) we could conclude that the vision not only included events of the past but also of the future. This is giving me Back to the Future vibes too as Marty has to get his parents together otherwise he’ll never be born. I read a fan fiction a while back that had a similar concept . Rey was pregnant , kylo was working to undermine the first order from within and she got visited by her children who hadn’t been born yet ( she was having twins ) through the force . One of them would visit her and the other would visit kylo through the force . It was lovely to be honest the way it was written and the kids appeared to their parents through various stages in their lives - mainly as little kids but at one point Rey’s son appears to her as a man and it’s really emotional and beautiful.I’ll post the link for the fiction in the fiction part of the forum . They could really do something like this because we have never had a couple who were force users like Rey and Kylo in Star Wars films before - we are in uncharted territory here and they could do anything . Am excited about this to be honest as I always am when they delve into spiritual force lore stuff because we may see many magical things between kylo and Rey and what it’s like for them to experience these being a force user . Others have been theorising that the macguffin could lead to a connection to earth somehow or another franchise . I really hope it isn’t the latter and that we end up in the marvel or aliens universe ( Disney own both now )but the earth reference I wouldn’t mind in the way the story of the skywalkers ends up on earth ( am sure George Lucas said something about this in the past ) in the book of the whills and it ends up here because .... maybe someone brings it to earth through world between worlds or the book itself . No idea how they would do it but that’s what’s going on online at moment . The other suggestion is that the macguffin itself is Ben solo . Delightful but controversial.Lol! We shall see. Maybe it's just me being biased because of my aversion of this theme- but all of this sounds too far fetched and weird. I remember there being a similar rumor about a "macguffin element" before TLJ came out. Something about Luke being on Ahch-To because he is chasing after some device and can't move on until he solves some riddle and Rey will help him blah blah blah. It would be so unexpected and awesome to have it before Celebration... Maybe they want to use it to announce the title? Read through and seems like the site is being mislead, particularly as to how trailers are sent to cinemas (in the UK especially). The recent Aladdin "trailer" hasn't & won't be hitting cinemas as it's a TV spot and hasn't been rated, neither has SW IX. Not to mention file name." I've put my piece on that earlier, we received a trailer for Aladdin a few weeks back but from what I understand this was just the 3D version of the original trailer rather than the new trailer that shows the Genie, I think this was just so we could show the trailer in front of HTTYD 3 and TLM2 in 3D compatible screens. From what I understand after speaking to my manager, trailers also rarely are sent out with a file name, they come encoded and until they're ingested on our system we don't know what the trailers are, so for a cinema to receive a file called TT1SW9, sounds incredibly unlikely." Triple Force Friday, for merch relating to IX, Mandalorian, and the video game Jedi: Fallen Order. Interestingly on October 4 instead of about a month earlier like they normally do. D23 Expo is also a month later than usual. @TracylovesOUAT wrote: Apparently there's concept art costume leaks on Reddit now. If real, IMO Rey's costume is decent, not as good as TLJ, but it works as a third costume. The link is below (I'm assuming I post this here & not under "crack" but maybe that's where this should go??? It's possible this is fake & just based off of previous "leaks." Otherwise, it does confirm the red mask thing.) It seems more legit than some, and if real, I find it interesting how Rey has a "bandage" over her arm scar. Huh, it looks like a cross between TFA Scavenger and Padme in AotC. So...back to a lighter color, eh? I'm not so sure I'm buying it. A lot of these costumes look like they were taken from other movies and characters. Everyone in that thread is freaking out and thinks it's real though. @Forsythia Yes, the photo JJ posted basically confirms that Reddit leak. And based on JJ's photo, Rey is totally covering up her scar. How symbolic. Hope this is the right spot for me to discuss spoilery info.. - is twitter stuff spoilery? I'm confused. anyway..
@TracylovesOUAT wrote: @Forsythia Yes, the photo JJ posted basically confirms that Reddit leak. And based on JJ's photo, Rey is totally covering up her scar. How symbolic. -Great point! that leak seems legit! There's been a few new leaks or photos shared this last week or two which is fun to see.. and soooo it all begins huh! I expect leaks and marketing to mislead.. or to keep main plot points under wraps - I'd be shocked if any positive reylo or redemption stuff comes out. And I'm fine with that. whatever comes our way in the next 10 months, what I saw in TFA and TLJ is not going to change. when I heard the mask is back and the three buns are back - I was meh about it. but I am also open to being taken on a great ride and being told a great story. I'm no longer meh about it - I can't wait to see what happens with his mask, and how it is used - in what circumstances will he take it off? how is it going to help tell Kylo/Ben's story? exciting times!!! The three buns are now captured in JJ's tweet so we can take a good look.. and I my view is - I think it looks different, updated.. and in a desert setting it works. Will Rey be letting her hair down in some way during the movie that's going to be meaningful? I like to think so..
@californiagirl wrote: Here's the screenshot of the above. I have much emotion. Looks like Jordan? Is Daisy's hair longer? People noting the armband covering her scar now confirmed. random thoughts - ah yes the focus on the 'trio' starts.. 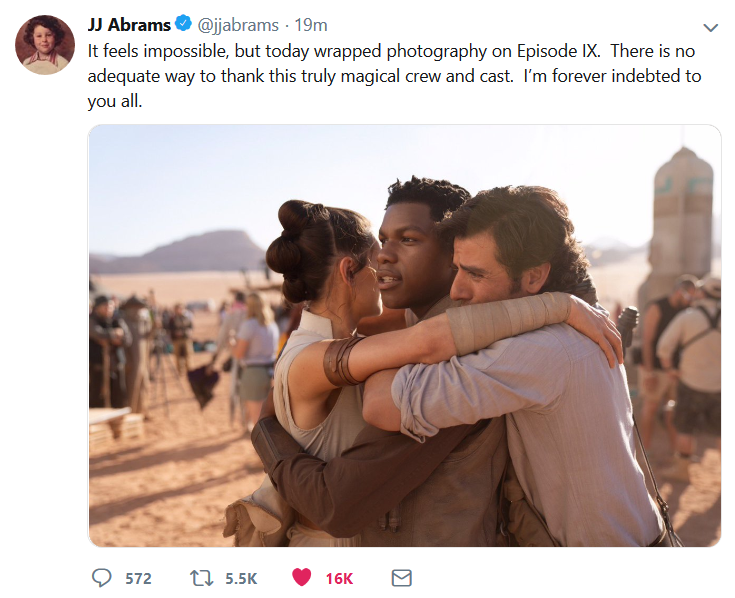 I kinda expect to see more of this.. and I just think - it's what the GA expect to see in IX and it's non spoilery.. JJ may be saying shooting is finished but I'm thinking this photo is not the final scene and it's probably not even a shot from filming, it's an onset photo. Maybe it was the final day of shooting in Jordon.. whatever. Wonderful to finally get a good clear shot of back of Daisy's head, her costume for the desert planet..(I like it!) a close up of John's new hair..
And rofl - the Stormpilots are going to love that Oscar Isaac is hugging John like that. Haaa..
My fave part? Daisy's arms! First- I didn't like the arm wraps in TLJ - too high and not flattering.. especially when they got wet (but I try not to focus on it and just focus on what I like). Finishing the wrapping lower is a much more flattering look. Second- Now the leather strap around her throne room scar. I LOVE this!!! Suggests she may be hiding the events of the throne room from others.. why? There's the idea that she is keeping the events under wraps because Kylo/Ben is now SL. So many wonderful possibilities - regardless of whether we just get trio marketing! All the chatter about the make up artist's Adam palette and what it could mean for Kylo in the twitter thread- I'm seeing lots of talk about blood and injuries because of all the red..fears for what he is in for etc. I'll counter this with - it could indicate a lot of blushing going on haaaa.. and kiss swollen lips.. ahem..
Rey’s hair is in the style above because it has to mach older footage of Rey that was shot with Carrie for The Force Awakens. The details of the sequence are not being talked about at this time, however. Sources believe the first trailer will be different than the one shown to the crew around Christmas of 2018. That trailer showed a bit more than you would think they want to share at this moment but didn’t delve into the plot at all. Everyone says it was so good and it was apparently scored using only Star Wars: Episode IX footage. So we might have a shot at seeing it at some point. In terms of that new Trooper from IX, there are over 50 of them. However, they are not being called Sith Troopers by anyone from Pinewood. That language apparently was picked up or appropriated by others as a synonym for “bad guys.” Those troopers do only answer to Kylo and the Knights of Ren though. The MacGuffin is controversial as an idea. However, sources say that’s not the case in execution. They have also said that the MacGuffin actually evolves as the story progresses. So we apparently won’t begin the film with everyone searching for something right off the bat. In theory that is an interesting way to start a Star Wars film with what we know about the movie so far. Sources have been pretty tight lipped about Matt Smith but I have also heard that the rumors he’s a Knight of Ren are incorrect. Sources also do not believe they are female or all of them are female. However, that rumor, if rooted in truth may have sprang forth because some stunt performers for the Knights of Ren were women. They also say that the threat in the film is not The Knights of Ren. So the idea they come from The Beyond and are the threat was not a good guess. There is still a threat from The Beyond, however. We can check them off the list. Rey will be betrayed by Poe and the ever increasingly radical rebels, Kylo will be betrayed by Hux and the Knights of Ren starting a civil war because some in the First Order will still support him because he will be a good ruler (Phasma?). Rey and Kylo will team up and end the war and create a New Order. The end.